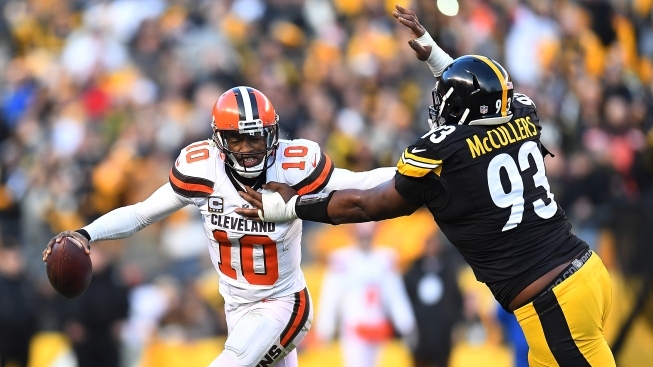 Robert Griffin III is coming back to the D.C. area -- kind of. The Baltimore Ravens have signed the former Washington Redskins quarterback to a one-year contract to back up starter Joe Flacco. The team announced the deal Wednesday morning. "He came in last week, worked out, had a real good workout, and we were able to come to an agreement late yesterday," Ravens' General Manager Ozzie Newsome said during a press conference Wednesday. "He will probably be here early next week to sign the deal." "I felt like he really wanted to be here, to be a Raven," Coach Jim Harbaugh added. Griffin, the 2011 Heisman Trophy winner, was the No. 2 overall pick in the 2012 draft, then earned NFL Offensive Rookie of the Year honors. But injuries plagued the remainder of his time with the Redskins. He was benched in favor of Kirk Cousins during the 2015 season. The Redskins released the former star quarterback the next year after he spent the season on the sidelines. The Cleveland Browns signed Griffin that year, but injuries limited him to just five games that season. He was released the following year.